Logo from A Husky Wrench No. 999 Socket Set. 11/05/2015: Updated company history and added a 1927 notice for Husky No. 999 set. 06/21/2011: Added a Husky HD-1 13/16-Hex Drive Ratchet. 04/25/2011: Added a Husky 13/16-Hex Drive 1-5/8 Hex Socket. 11/25/2010: Added a Husky No. 21 9/16-Hex Drive Speeder. 06/28/2010: Added a Husky Early [No. 1] 9/16-Hex Drive Ratchet. 02/10/2009: Minor updates to history. 02/08/2009: Added a Early Husky Wrench Linecard. 01/29/2009: Minor updates to history, added link to advertisement. 05/24/2007: Added patent table, added a Husky-Williams No. 642 Wrench Set Illustration. 03/17/2007: Added notes on collaboration with J.H. Williams. 01/15/2007: Moved HeXo Wrenches to Blackhawk page. 10/07/2006: Added a Husky 9/16-Hex Drive No. 986 Socket Set. 09/19/2006: Added a Husky 9/16-Hex Drive No. 5 Extension. 09/13/2006: Added a Husky 9/16-Hex Drive 7/8 Socket. 09/12/2006: Added a Husky 9/16-Hex Drive No. 2 T-Slider Breaker Bar. 09/11/2006: Added a Husky 9/16-Hex Drive No. 1 Ratchet. 09/10/2006: Added a No. 3 Speed Crank and a No. 4 Rotating-Grip Extension, both part of a No. 986 Socket Set to be shown soon. 08/31/2006: Added catalog references for Husky. 05/08/2006: Minor updates to text. 04/19/2006: Added photos of 13/16 hex drive ratchet plug and sockets. 04/06/2006: Page just added, only a few photos. The Husky Wrench Company operated only briefly as an independent tool maker, but left a legacy that includes the very well known "Husky" trademark. In this article we'll look at some examples of their tools from the mid 1920s through 1930 or so. Although not much information is available for the Husky Wrench Company, we can piece together a rough outline of their history from various records. Husky Wrench was founded in 1924 by Sigmund Mandl, Joseph O. Wirtish, Oscar W. Engerson, and John G. Zummach, several of whom had previously worked for the Snap-On Wrench Company. According to a notice in the 1924 Automotive Industries (Volume 50, page 1309), Mandl, Wirtish, and Engerson were former employees of Snap-On, where Wirtish had been a manager. Several other contemporary sources provide similar information, and note the initial capital stock as $50,000. Zummach had previously been a manager at Zummach Engineering Service and initially was named Secretary and Treasurer of the new Husky Wrench, according to a notice in the 1924 SAE Journal (Volume 15, Issue 1, Page 8). A later notice in the 1925 Machinery (Volume 32, page 846) listed slightly revised management roles, with Zummach as president and treasurer, Mandl as vice-president, and Wirtish as secretary. Regardless of the formal management assignments, Sigmund Mandl operated as the chief engineer and driving force for the company, and his name appears on the trademark and patent applications for Husky Wrench. The founding date for the company is believed to have been January 29, 1924, the date listed as the first commercial use of the Husky name on their trademark application. Mandl filed the application for the "Husky" underline trademark on February 9, 1924, and the registration was issued on July 22 of that year. The application listed the company address as 1610 Vliet Street in Milwaukee, Wisconsin. Sigmund Mandl received several patents for Husky Wrench, the first of which was filed on February 1 of 1924, just days after the company was formed. This patent covered the design used in their No. 1 Ratchet, and was issued as #1,614,039 with an assignment to the Husky Wrench Company of Milwaukee. The timing of the patent suggests that this ratchet design was the major impetus for founding the company. Fig. 1. 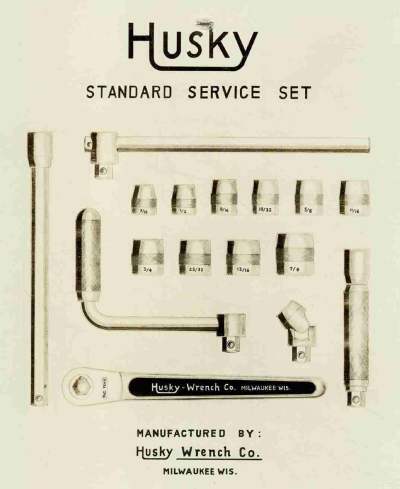 Husky Wrench Standard Service Set Linecard, 1924. Fig. 1 at the left shows the company's products as illustrated on a 1924 linecard or advertising brochure, providing an example of the distinctive Husky logo in the trademark application. The tools in the illustration closely resemble the contents of the Husky No. 986 Socket Set described in a later figure. Currently nothing is known about what kind of production facilities Husky Wrench may have had, or whether they made use of outside production for their tools. 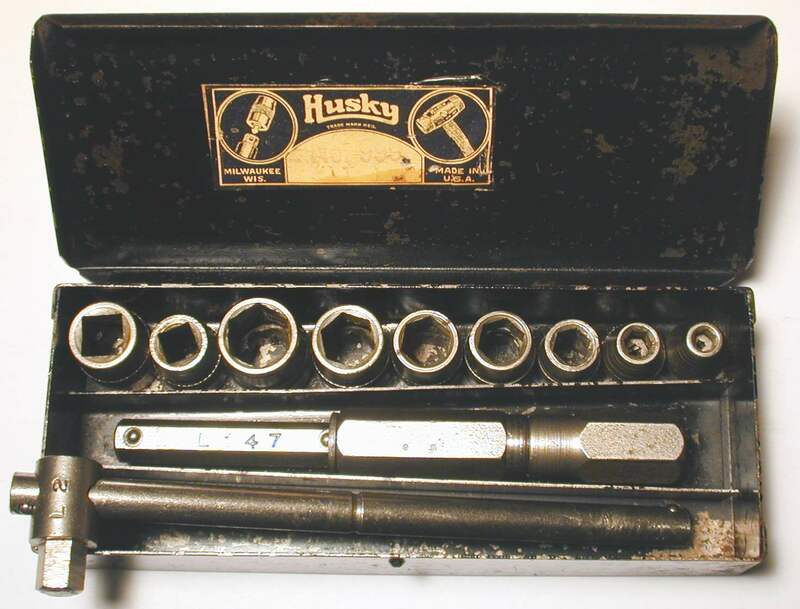 However, the new company was apparently able to get their tools into the distribution channels: the Dunham, Carrigan & Hayden Company, a San Francisco-based industrial supplier, mentions Husky in their 1925 catalog. The Dunham catalog shows two Husky socket sets, a No. 986 set that turns out to have 9/16-hex drive, and a "Heavy Duty" set that was likely 13/16-hex drive. The No. 986 set included a No. 1 ratchet, a sliding Tee handle, a "speed crank" (similar to the Blackhawk T15), an extension with a rotating grip, a universal, and adapter, and 10 hex sockets. Sigmund Mandl filed a patent application in 1925 for the design of the No. 986 set, and received patent #1,775,402 in 1930. By 1925 Husky Wrench was also placing advertisements for its tools in some of the popular magazines on the time. For example, an ad in the April 1925 issue of Popular Mechanics shows the Husky No. 986 Socket Set on page 134 at the top right. Husky Wrench also made use of trade publications to publicize its tools. The notice at the left was published on page 879 of the December 1, 1927 issue of American Machinist and describes the Husky No. 999 "baby" socket set. An example of this set can be seen as the Husky Wrench No. 999 Set in a later section. The agreement between J.H. Williams and Husky was widely reported in the trade publications of the time. For example, the 1928 April-June issue of Railway Age mentions the agreement between the two companies, but notes that it only covers product sales. Similary, a 1928 issue of The Motor Truck (v.19 1928 January-May) has an article captioned "Williams-Husky Join Selling Forces". 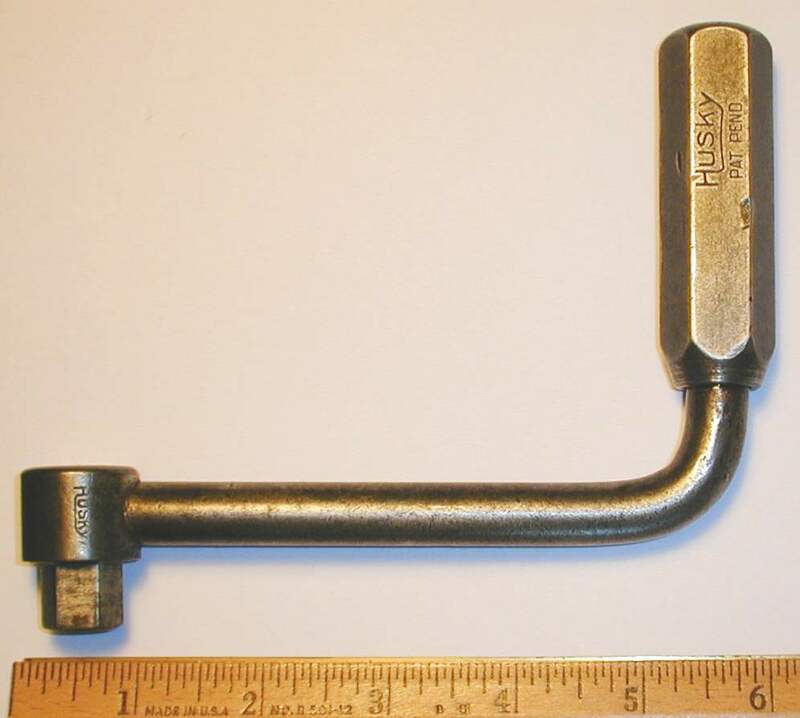 By January of 1929 Husky Wrench had changed its name to the Husky Corporation, and later that same year moved to a larger facility in Kenosha, Wisconsin. The name change is mentioned in a 1929 issue of Motor Record (v.25 1929 Janary-June), and a later patent document (#1,724,491) gives an assignment to Husky Corporation in Kenosha. The 1930 Donnelley's Industrial Directory (Midwest Region) includes a listing for Husky Corporation and gives their address as Lake Shore Road in Kenosha, Wisconsin. Recently discovered information provides a more specific rationale for Husky's move to Kenosha. An article in the January 13, 1929 edition of the Chicago Tribune states that the Husky Corporation had been purchased by Olsen Manufacturing of Kenosha, a company founded in 1928 by H.P. Olsen, a Milwaukee businessman and publisher. Olsen Manufacturing set up operations in a large truck factory previously used first by the Winther Motor Truck Company, and then later by the Kenosha Fire Engine & Truck Company. The announcement of Olsen Manufacturing assuming operations in the truck factory was found in a 1928 edition of Power Wagon, and is also noted in a 1928 (v. 19) issue of The Motor Truck. We haven't found much information on Olsen Manufacturing, but they appear to have produced hydraulic jacks under the "Little Giant" brand. In addition, advertisements have been found for "Husky Hydro" hydraulic jacks, suggesting that the company's production was used for both brands. At least one patent was issued to Olsen Manufacturing covering the design of a hydraulic jack. This brought to an end the brief history of the Husky Wrench Company, but the Husky name continues as a well-known tool trademark today, and Sigmund Mandl found continued success as an engineer for Blackhawk. 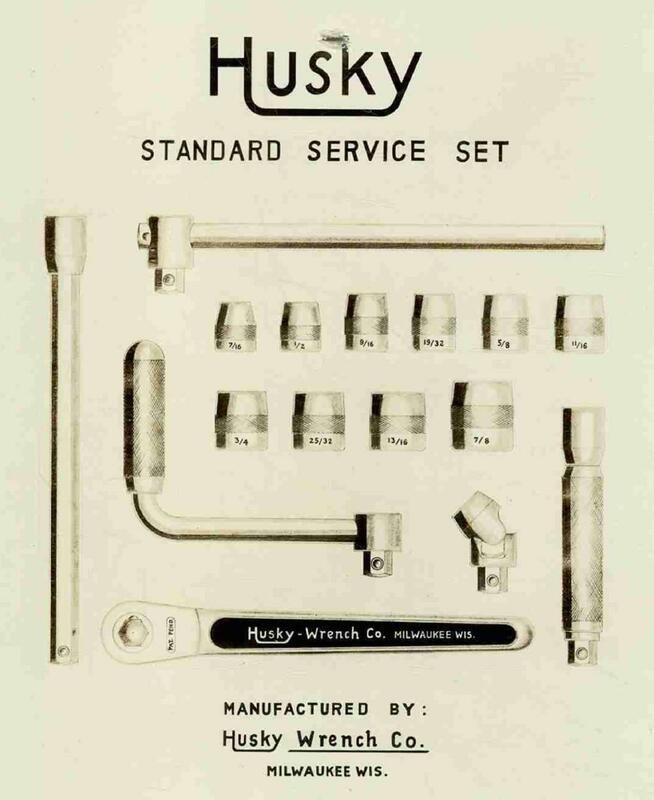 On February 9, 1924, Husky Wrench filed an application for the name "Husky" with an underline joining the "H" and "Y" letters. The first use date was listed as January 29, 1924, and the trademark was issued as #186,808 on July 22, 1924. On the application the company listed it products as "Socket Wrenches" and "Socket-Wrench Sets", and the address was noted as 1610 Vliet Street in Milwaukee. Currently we do not have any Husky Wrench catalogs, but have found references to Husky in catalogs from two industrial suppliers. Dunham, Carrigan 1925. The 1925 catalog No. 73 from the Dunham, Carrigan & Hayden Company, a wholesale hardware and industrial supplier, lists a selection of Husky Wrench socket wrench sets and tools on page 1514. The tools listed include a No. 986 socket set and a "Heavy Duty" set. We refer to this important reference as the "1925 Dunham catalog" in the text. McMaster-Carr 1928. The 1928 catalog No. 28 from the McMaster-Carr Supply Company, an industrial distributor, lists a "Husky Combination Mechanics' Wrench Kit" that shows a collaboration between Husky and the J.H. Williams Company. The set consisted of Husky sockets and drive tools together with Williams "Superrench" tappet and open-end wrenches in either engineers or obstruction styles. The customer could specify either 1/2-square or 9/16-hex drive for the socket parts, and the price (including a steel carrying case) was $24.75 net. Husky Wrench could be considered as a socket tools specialist, as their currently known production consists only of sockets and drive tools. The company produced a variety of such tools, with drive sizes ranging from 5/16 hex up to 13/16 hex drive. In their early production Husky appeared to favor hex drives in non-standard sizes, but later production included (or switched entirely) to standard square drives. It's possible that the company produced other tools as well, and we'll expand the coverage here if additional examples are acquired. The next few figures show a rather unusual set of tools, a Husky Wrench No. 999 socket set with 5/16-hex drive. The 5/16 hex drive size is rather uncommon and may be unique to Husky Wrench. Fig. 2. Cover of Husky Wrench No. 999 Socket Set. Fig. 2 below shows the cover of the No. 999 set, with a distinctive logo identifying the contents as "Common Sense Wrenches". The box is very well made with wrap-around corners and spot-welded construction, and the hinge for the lid runs the full length of the box. The dimensions are 5.4L x 2.2W x 1.0H. Fig. 3. Husky Wrench No. 999 5/16-Hex Drive Socket Set, ca. 1924-1928. Fig. 3 at the left shows the contents of the No. 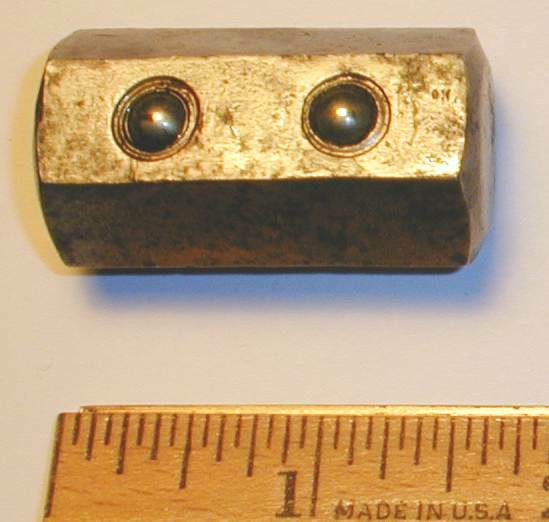 999 set, consisting of an L2 sliding Tee handle, an L147 extension with a rotating grip, seven hex sockets ranging from 5/32 to 7/16, and two square sockets of size 1/4 and 5/16. The sockets are marked with an "L" followed by the size, with a "Hex" or "Sq" mark to indicate the broaching. For example, the 7/16 hex socket is marked "L 7/16 Hex", as can be seen in Fig. 6 below. The paper tag on the inside of the lid shows the "Husky" logo with the "Trade Mark Reg." notation. After looking up the trademark record on the USPTO site, we find that this mark was filed on Feb. 9, 1924 and issued July 9, 1924, so we at least know that this set was manufactured after the latter date. Fig. 4. Husky Wrench 5/16 Hex Drive L2 T-Slider, with Inset for Logo, ca. 1924-1928. Fig. 4 shows the Husky Wrench model L2 5/16 hex drive sliding Tee handle from the No. 999 set, marked with the Husky logo. The overall length is 5.1 inches. Fig. 5. Husky Wrench L147 5/16 Hex Drive 4 Inch Extension, with Inset for Logo, ca. 1924-1928. Fig. 5 shows the Husky L147 5/16-drive 4 inch extension from the No. 999 set, marked with the Husky logo on the drive end. The overall length is 4.4 inches. The finish is a bright plating that appears to be nickel. The rotating grip is an unusual feature for an extension of such a small drive size. Fig. 6. Husky Wrench 5/16-Hex Drive Socket, Marked "L 7/16 Hex", with Inset for Logo, ca. 1924-1928. Fig. 6 shows a close-up of one of the sockets from the No. 999 set, a 7/16 size marked "L 7/16 Hex". 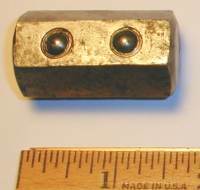 The socket has a cross-hatched band around the center, and the finish appears to be nickel plate. The socket is marked "HeX" in a rather distinctive style, with the middle letter raised and a tail from the "H" underlining the word; note the similarity to the motif used in the Husky trademark logo. This "HeX" marking may be significant, as it closely resembles the marking style on the later "HeXo" Wrenches made by Blackhawk. The Alloy Artifacts Collection includes an interesting Husky Wrench No. 986 socket set featuring drive tools in the previously unknown 9/16-hex drive size. The set was identified by the illustration in the 1925 Dunham catalog, and based on the catalog listing, our set is complete except for a 1/2-drive adapter. We'll begin with a photograph and description of the full set, and then present the individual tools in greater detail. The model numbers cited below are those used in the Dunham catalog, as none of the tools are marked with model numbers. Fig. 7. Husky Wrench No. 986 9/16-Hex Drive Socket Set, ca. 1925-1926. Fig. 7 shows the full Husky Wrench No. 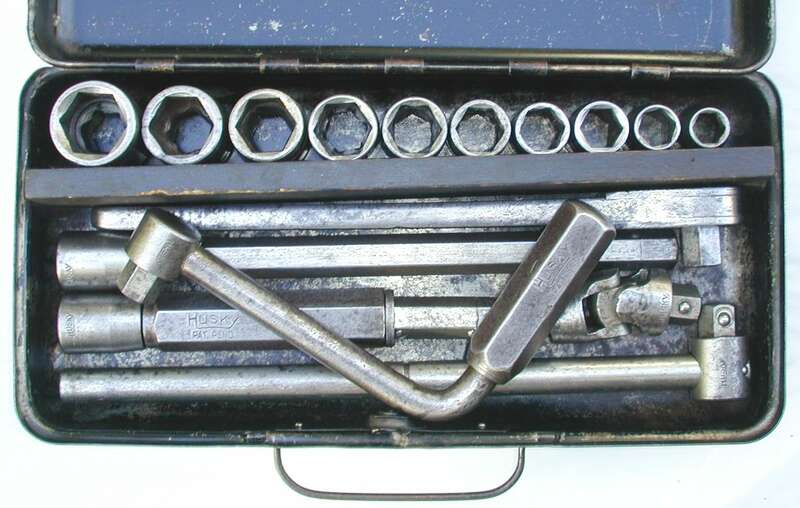 986 socket set in its metal case, with the wire carrying handle at the front. Inside the case a wooden divider keeps 10 hex sockets organized at the back, with sizes (left to right) 7/8, 13/16, 25/32, 3/4, 11/16, 5/8, 19/32, 9/16, 1/2, and 7/16. The front part of the case shows a No. 3 crank speeder on top, with (from top to bottom) a No. 1 ratchet, No. 5 extension, No. 4 extension, No. 6 universal, and a No. 2 T-slider breaker bar. Fig. 8. Husky Wrench 9/16-Hex Drive No. 1 Ratchet, ca. 1925-1926. Fig. 8 shows the 9/16-hex drive Husky Wrench [No. 1] ratchet from the 986 set, marked with "Husky Wrench Co." and "Milwaukee Wis" forged into the handle. The overall length is 10.0 inches. The original finish appears to have been nickel plate on the face and handle edges, with black paint in the handle recess. We know from other examples that the Husky ratchets are described by patent #1,614,039, which was issued in early 1927. Later ratchets include the patent number in the forged markings, and its omission here suggests a manufacturing date before the patent was issued. The ratchet mechanism uses a 12-tooth gear with asymmetrical teeth, as described in the patent. The unmarked plug pushes through to reverse the action. A later example of this model can be seen as the Husky No. 1 9/16-Hex Drive Ratchet. Another later version, but with 1/2 square drive, is shown as the Husky 1/2-Drive No. 1 Ratchet. Our next drive tool from the No. 986 set is referred to as a "Combination Tee" in the catalog. Fig. 9. Husky Wrench 9/16-Hex Drive No. 2 Sliding Tee Handle, ca. 1925-1926. In Fig. 9 we see a 9/16-hex drive Husky Wrench No. 2 sliding Tee handle, marked with the Husky logo on the head, and with "Pat. Pend." on the reverse side (not shown). The overall length is 10.5 inches, and the finish is nickel plating. The breaker bar is of conventional design but very well built with a hardened head. Note also the superior design feature of the cutout slot on the head, which allows the head to move to the extreme end of the bar. Fig. 10. Husky Wrench 9/16-Hex Drive No. 3 Speed Crank, ca. 1925-1926. Fig. 10 shows a 9/16-hex drive Husky Wrench No. 3 speed crank, marked with the Husky logo and "Pat. Pend." on the handle grip. The throw is 5.0 inches and the overall length (diagonal) is 7.3 inches. The finish was originally nickel plate, but only a few traces now remain. The speed crank or half-speeder is a fairly uncommon type of drive handle, and is known only by the current example and the similar Blackhawk T15 Crank Speeder. It appears likely that this design may have originated with Husky Wrench, as the present No. 3 model is illustrated in the 1925 Dunham catalog, but Blackhawk's T15 model is not listed in that same reference. Fig. 11. Husky Wrench 9/16-Hex Drive No. 4 Rotating-Grip Extension, ca. 1925-1926. Another of the tools from the No. 986 set is shown in Fig. 11, a Husky Wrench No. 4 extension with a rotating hand grip. The drive end and grip are marked with the Husky logo, and a "Pat. Pend." notice appears on the grip. The overall length is 6.9 inches. The patent pending notice was found to refer to patent #1,775,402, filed in 1925 and titled "Wrench Outfit". The patent illustration shows the design for all of the tools in the No. 986 set, and shows how the pieces work together. Fig. 12. Husky Wrench 9/16-Hex Drive No. 5 Extension, ca. 1925-1926. The longer extension from the No. 986 set is shown in Fig. 12, a Husky Wrench No. 5 extension marked with just the Husky logo. The overall length is 9.4 inches. The finish is now mostly plain steel, but some traces of the original nickel plating remain. Fig. 13. No. 6 Universal to be added. Fig. 14. Husky Wrench 9/16-Hex Drive 7/8 Socket, with Inset for Broaching, ca. 1925-1926. Fig. 14 shows a representative socket from the No. 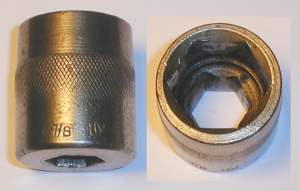 986 set, a 9/16-hex drive Husky 7/8 hex socket marked "Hy" in a distinctive style. The socket has a shallow knurled band in the center, more decorative than functional, and the upper walls are tapered for access in tight places. The finish is nickel plate. The socket construction is cold-broached with a machined recess below the broaching, and the socket is hardened to the point that a file will barely touch it. Fig. 15. Husky Wrench Early [No. 1] 9/16-Hex Drive Ratchet, with Inset for Side View, ca. 1924-1927. Fig. 15 shows another example of an early 9/16-hex drive Husky Wrench [No. 1] ratchet, marked with "Husky Wrench Co" and "Milwaukee Wis" forged into the shank, and with "Pat. Pend." stamped on the face. The overall length is 9.5 inches. The finish shows traces of nickel plating on the faces, with some black paint remaining on the handle. The pending status refers to patent #1,614,039, filed by S. Mandl in 1924 and issued in early 1927. The 9/16-hex drive tools remained in production for some number of years, at least until after Husky had moved to Kenosha, Wisconsin and updated their forging dies. Fig. 16. Husky Wrench 9/16-Hex Drive No. 1 Ratchet, ca. 1929 to Early 1930s. Fig. 16 shows a later production 9/16-drive Husky Wrench No. 1 ratchet, with "Husky Ratchet No. 1" and the patent notices "Patent No. 1,614,089" and "Patent No. 1,628,467" forged into the shank. The overall length is 10.4 inches. The forged body for this ratchet matches that of the 1/2-drive Husky No. 1 Ratchet shown in a later figure. In particular, the reverse is marked "Husky Corporation Kenosha Wis" and "Made in USA", as shown in the later example. Fig. 17. Husky Wrench 9/16-Hex Drive No. 21 Speeder, with Insets for Construction and Marking Detail, ca. Late 1920s to Early 1930s. Fig. 17 shows a 9/16-hex drive Husky Wrench No. 21 20 inch speeder, stamped with the Husky underline logo and model on the hexagonal end-piece. The overall length is 19.8 inches, and the finish is nickel plating. Husky also offered a line of heavy-duty sockets and drive tools, which were based on yet another non-standard drive size, 13/16-hex drive. Currently we have only a few examples of these tools for display, but hope to offer more in the future. Fig. 18. Husky Wrench HD-1 13/16-Hex Drive Ratchet, with Insets for Reverse and Side View, ca. 1924-1928. Fig. 18 shows a Husky Wrench HD-1 13/16-hex drive ratchet, marked with "Husky Ratchet" and "HD-1" forged into the shank, with "Husky-Wrench Co." and "Milwaukee, Wisc" plus "Made in U.S.A." forged into the reverse. The overall length is 19.9 inches, and the finish is plain steel. This ratchet was acquired as part of a "Heavy Duty Set" of 13/16-hex drive tools. We're currently preparing the set for display. Fig. 19. Husky Wrench 13/16-Hex Drive Ratchet Plug, ca. 1924-1928. Fig. 19 shows a 13/16-hex drive ratchet plug for use with the HD-1 ratchet. Fig. 20. Husky Wrench 13/16-Hex Drive 15/16 Sockets, with Inset for Broaching, ca. 1924-1928. Fig. 20 shows a group of three 13/16-hex drive 6-point sockets, all with the same 15/16 size. Note that the hex openings at the bottom of the photograph are the drive ends. The left and middle socket are marked with an "HY" logo, with the "H" underlining the "Y". (Perhaps this was Husky Wrench's equivalent of the Snap-On S/O-overstrike.) The righthand socket is marked "H 15/16 Hex", with the "H" in "Hex" underlining the word. 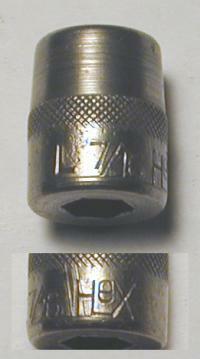 This marking is very similar to the mark for the L 7/16 Hex Socket shown in Fig. 6 above. The inset at the top shows the broaching for the sockets. The construction is cold-broached with a recess for chip removal, the standard method for socket construction in the early to mid 1920s. Fig. 21. 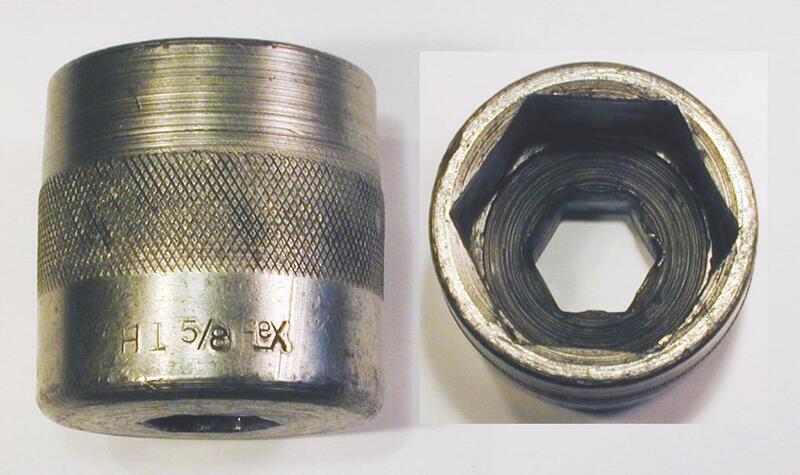 Husky Wrench 13/16-Hex Drive 1-5/8 Hex Socket, with Inset for Broaching, ca. 1924-1928. Fig. 21 shows a 13/16-hex drive Husky 1-5/8 hex socket, stamped with "H1-5/8" and "Hex" on the side. The finish is nickel plating. This socket was acquired as part of a "Heavy Duty Set" of 13/16-drive tools. The earlier drive tools from Husky Wrench appear to have used primarily (perhaps exclusively) hex drive studs, and in non-standard sizes such as 5/16, 9/16, and 13/16. In their later production Husky adopted the industry-standard 1/2 square drive, as the following example illustrates. Fig. 22. Husky Wrench 1/2-Drive No. 1 Ratchet, with Inset for Reverse, ca. 1929 to Early 1930s. Fig. 22 shows a Husky Wrench 1/2-drive No. 1 ratchet, marked "Husky Ratchet No. 1" plus patent notices on the front, with "Husky Corporation Kenosha Wis" and "Made in USA" on the reverse. The tool forging includes the patent notices "Patent No. 1,614,089" and "Patent No. 1,628,467", but it turns out that the first number is listed incorrectly; the actual patent issued was #1,614,039. Both patents were filed by Sigmund Mandl in 1924, and were issued on Jan. 11, 1927 and May 10, 1927, respectively. The #1,614,039 patent was probably a key factor in the founding of the new Husky Wrench company, as the patent was filed only a few weeks after the company began operations. An interesting detail to note is that this ratchet is marked with Kenosha instead of Milwaukee. Husky Wrench was founded in Milwaukee and listed that city on its earlier tools, but moved to Kenosha in 1929. From the Kenosha marking we can assign a manufacturing date of 1929 or later. In the late 1920s Husky Wrench established a marketing alliance with J.H. 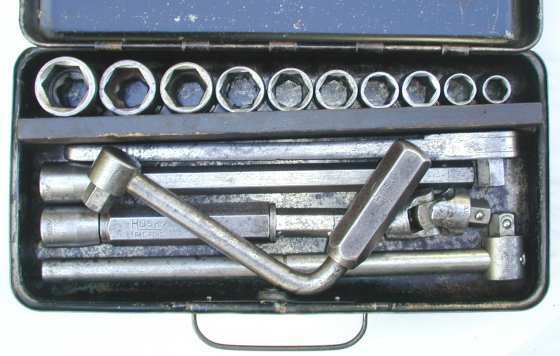 Williams & Company, and the two companies produced socket wrench sets combining Husky socket tools with Williams wrenches. Such sets were popular at the time, and as Husky didn't make wrenches and Williams didn't (yet) make sockets, combining forces was just common sense. The evidence for this collaboration is currently based on catalog illustrations and published notices in trade publications, as the combination wrench sets themselves are somewhat difficult to find. Listings for Husky-Williams wrench sets are currently known from the 1928 McMaster-Carr catalog No. 28 and the C.W. Marwedel catalog No. 12, but other references may turn up in the future. We'll show an example of a catalog illustration in the figure below, and additional examples can be found in our article on the J.H. Williams-Husky Collaboration. Fig. 23. Catalog Listing of Husky-Williams E-642 and O-642 Combination Wrench Sets, 1928. Fig. 23 at the left shows a catalog illustration of the Husky-Williams Nos. E-642 and O-642 combination socket wrench sets, as found in a 1928 McMaster-Carr catalog published more than 75 years ago. Although the description doesn't mention the Williams name, the use of the "Superrench" trademark clearly identifies Williams as the maker of the wrenches in the set. The wrench sets were offered in two variations, one including Engineer's (open-end) wrenches, the other with obstruction wrenches. (See the Williams 2027C Obstruction Wrench for an example of the latter.) Both sets included six tappet wrenches. 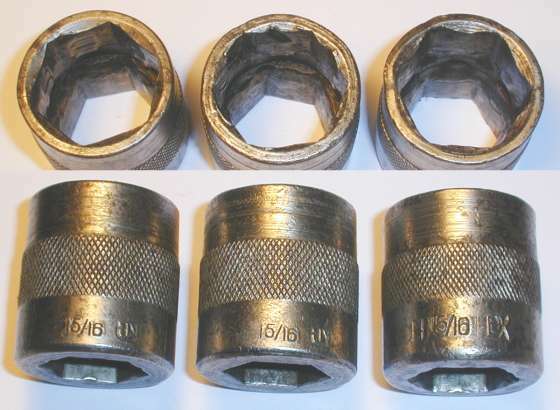 In addition, the description states that the customer could choose between 1/2 square or 9/16 hex drive socket tools, showing that Husky Wrench was producing both configurations by this time.